Brad Pitt starred in a movie 30 years ago: “A River Runs Through It.” The general theme revolved around two brothers and their father fly-fishing in the Montana Mountains. It stuck with me for the past three decades. Did the movie examine the fishermen or the river? Every time I ride “Condor” on major touring adventures, I fancy a feeling that the concrete or gravel beneath my tires represents a “meandering river----thrilling, tingling, vibrating and enhancing every cell in my body as I follow it toward the horizon.” The journey offers colorful sights, amazing skies, tremendous sunsets and captivating campfires. As in the photograph of this vignette, I got up at 4:30 a.m. to ride up the “Road Going to the Sun” in Glacier National Park, Montana. The mist captured my heart as it weaved its way through the glowing rays of the rising sun over St. Mary’s Lake. Once on the road, with no traffic at that hour, I spread my emotional wings for a flight into never-never land, much like Peter Pan. Such moments create a romantic-emotional-spiritual connection between you and the universe. Such moments thrill your very being. Such moments let you know you live at the highest level of energy, love, joy and peace. Yes, I talk to Condor on my travels. I thank him. I thank people along the way. I appreciate everyone and everything. I especially appreciate that asphalt river beneath my pedals for it gives me wings to fly across all the continents on this wondrous planet. 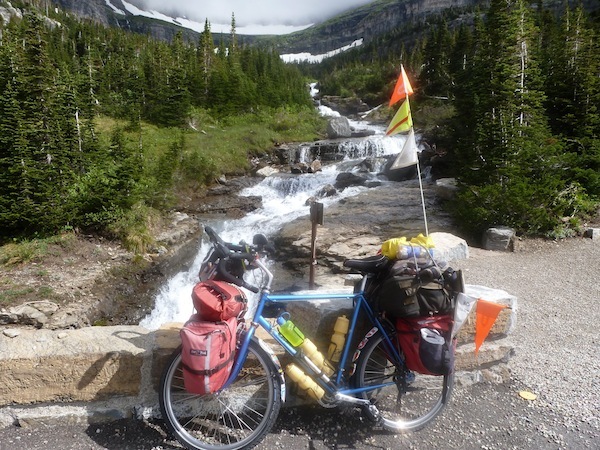 Frosty Wooldridge, on tour, Glacier National Park, Road Going to the Sun, Condor resting by a river raging beneath the snowfields in July.